Pumpkin and squash were historically favored by Italy’s Jews. You could find these fall fruits in soups, risottos, pastas, stews, fritters, and yes, even cake. 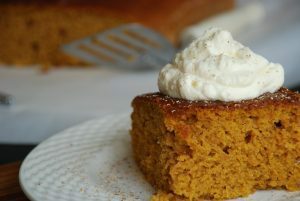 I found recipes for Jewish-Italian pumpkin cakes, but decided to develop an updated version. 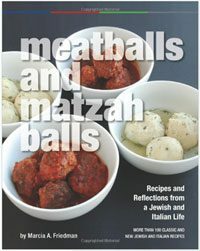 We served samples of this during my talk in September about the culinary history of Italy’s Jews. When I started working on this recipe, I wanted it to honor its Jewish-Italian roots but also be accessible to today’s cooks and diners. The olive oil and lemon zest mark the cake’s Mediterranean heritage (and the use of olive oil rather than butter keeps the cake nondairy). The canned pumpkin, well, that’s a nod to modern convenience, because I wanted a recipe that even busy cooks could reasonably have a chance to create. If you are familiar with Italian cakes, you’ll know that many feature ground nuts (usually ground almonds). For many of us today, ground almonds and sponge cakes also mark a Passover cake. I found one recipe that omitted the ground nuts, and gladly took that route, both to have a clear departure from Passover and also have a cake that people with nut allergies could safely enjoy. Topping a pumpkin cake can be easy—some confectioners’ sugar can do the trick nicely (which also keeps the dessert nondairy). However, to make this extra special and to play off the cake’s warm spice notes, I created an orange-mascarpone topping. It’s just the right blend of fluffy and creamy, and the orange makes it seem fresh and sweet without the need for much sugar. Honestly, this can be eaten by itself (yes, I’ve seen this done). But let’s say you stick with the plan for putting it on the cake—you don’t need a lot of it; just spoon a little on each slice of cake right before serving. Together, cake and topping make a beautifully flavored dessert for the entire fall season. Italy’s Jews used pumpkin and squash often in their cooking, so it shouldn’t be a surprise that they used it in cake. This beautifully moist and flavorful adaptation of a couple of Jewish-Italian recipes features my special addition of orange-mascarpone topping. The cake is best made the day before serving and stores nicely at room temperature, though you can refrigerate it if you like; make the topping up to 6 hours ahead. Grease and flour a 9-by-13-inch baking pan. In a bowl or on sheet of wax paper, lightly whisk the flour, baking powder, baking soda, salt, cinnamon, ginger, allspice, and nutmeg. In a large bowl, combine the granulated and brown sugars. Add the eggs and oil and beat with an electric mixer on medium-high speed about 2 minutes (the mixture should be smooth and slightly lightened in color). At low speed, mix in the pumpkin, vanilla, and lemon zest. Mix in the flour mixture until just combined. Pour batter into prepared pan and smooth the top. Bake 30 to 40 minutes, until the cake begins to pull away from the sides of the pan and a tester inserted in center comes out clean. Transfer pan to a wire rack to cool completely. Store covered at room temperature until ready to serve. In a large bowl, beat the cream with an electric mixer on high speed until it holds soft peaks, 2 to 3 minutes. In a separate medium bowl, blend the mascarpone, sugar, zest, juice, and vanilla on medium speed until combined. Use a spatula to gently fold in the cream. Cover and refrigerate until serving time. Serve cake slices with a dollop of topping. For a nondairy dessert, omit the topping and simply dust the cake slices with confectioners' sugar.